[Episcopal News Service] Presiding Bishop Michael Curry preached a sermon “on the occasion of the liturgical signing of the covenant of reconciliation” on May 23 at the Episcopal Theological Seminary in Port-au-Prince, Haiti. All clergy in the diocese attended the special liturgy. “Mutual forgiveness and repentance, healing and reconciliation are hard work and they often take time. Healing and reconciliation do not happen quickly. But it happens, if we are willing, to allow God’s grace to work in us, for God’s grace is sufficient. God is able,” said Curry in his sermon. The May 23 liturgy included a formal signing of the covenant, which took effect in April. My brothers and sisters, I greet you, in the Name of our Lord and Savior Jesus Christ. I likewise bring you the greetings of your brothers and sisters in Christ who are, with you, the Episcopal Church, or, better yet, the Episcopal branch of the Jesus Movement. I give our God thanks for you, for the faithful ministries of clergy and lay people here. For you the clergy of this diocese, for the people of the the churches, parishes and missions, for all of the schools which educate new generations of children, for clinics and hospitals which care for the sick, for ministries like St. Vincent’s School for the Handicapped, the Center for Agriculture of St. Barnabas, the Music School of Holy Trinity, for the ministries you and many share with groups like Episcopal Relief and Development, Fresh Ministries, Food for the Poor, Heifer International, Episcopal University of Haiti, and many, many more. But I want to add a special word of thanks, and thanksgiving to Almighty God. In the Sermon on the Mount found in Matthew chapters 5-7, the Lord Jesus taught us that the way of love is often realized in our willingness to go the second mile, sometimes when it hurts. The way of love, Jesus taught us, is the way of the cross, willingness to sacrifice self-interest, and even self, for the good of others. That is the way of Jesus. And he is our Lord! And we are his followers, his disciples. you in this Covenant have been willing to go the extra mile, as Jesus taught us. 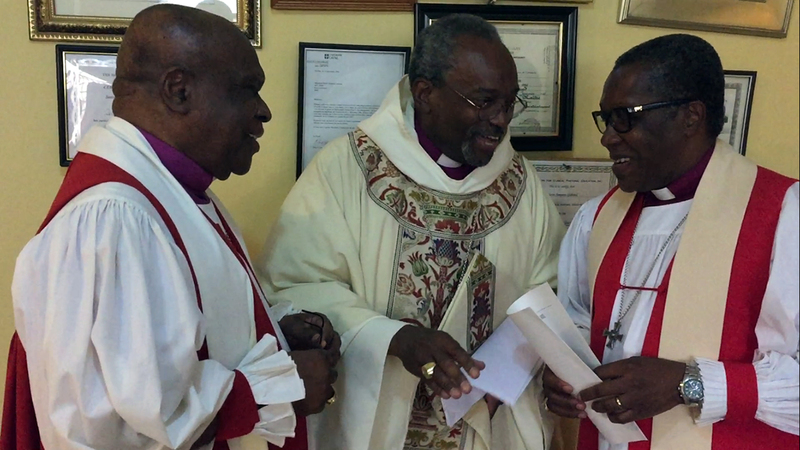 For the good of the people, for the good of the nation and for the good of the Episcopal Diocese of Haiti. You have sacrificed self-interest for the good of all. You have been willing to begin the hard and difficult work of healing. You have been willing through this Covenant to open the way that leads to reconciliation. I thank you. And to God be the glory! It was on the cross, as he was dying, that our Lord Jesus forgave even those who had tortured and crucified him. “Father, forgive them. They know not what they do.” Our beloved brother, Archbishop Desmond Tutu of South Africa, has shown us that Jesus teaches us from the cross that forgiveness is the way to a new future. He says that without forgiveness there is no future. Mutual forgiveness and repentance, healing and reconciliation are hard work and they often take time. Healing and reconciliation do not happen quickly. But it happens, if we are willing, to allow God’s grace to work in us, for God’s grace is sufficient. God is able. And through this Covenant we — Bishop Duracin, Bishop Beauvoir, the Standing Committee, the Reverend Clergy, and I, as your Presiding Bishop, all of us together, we take this step in which we each repent for any way we have hurt each other, we take a step toward mutual forgiveness, a step toward God’s healing, a step toward reconciliation through the blood of Jesus Christ on the cross. This I commit to do, and I pray and believe you join me in that. Now we are not perfect. We will make mistakes along the way. But if we press on, following this way of Jesus, walking together, upholding each other, we will make it because God’s power, working in us can do more than we can ask or imagine. And this world needs our witness. People need to know the power of God to heal, to forgive, to reconcile and rebuild. People need to know the power of our faith as we press on toward the Kingdom of God. As St. Paul said in Philippians. So why does this matter? To Haiti? To the world? Pay attention to the roots, the source, the origin. The key is always there, in the roots. I recently went on a pilgrimage to Ghana in West Africa. I’ve been to Ghana before, but I had not been to the slave camps, or to the castles where newly captured people, imprisoned and then boarded on ships for sale and slavery in the Americas and the Caribbean. At the site of the slave camps, evidence of what happened there is still visible. Bowls for food chiseled in the rock, by the slaves, hundreds of years ago, are still there. Water wells dug in the ground, are still there. Burial grounds for those who died, are still there. In the oral tradition of our ancestors who told the story of what happened there, passing the story down from generation to generation, you can see and hear the cries of our African forbearers, longing to breathe free. And then there were the trees standing in the field surrounding the slave camps. People were tied to those trees at night. Those trees saw it all. Those trees, still there, are witnesses to what happened. Those trees, like the tree that became a cross, bear witness. One of the trees, on which undoubtedly hundreds of enslaved people were tied had a root system underneath it, the likes of which I have never seen. The roots above the soil were large and thick. And you could see them digging down into the soil where the minerals and sources of life are to be found. The roots of the tree are the key to the life of the tree. Jesus of Nazareth, crucified and risen from the dead, he is the root, he and his way are the keys to the future of the Diocese of Haiti and to the entire Episcopal Church. Jesus is the root which anchors us when the storms of life threaten to tear us down. So why does this work of reconciliation, this covenant, matter? It’s all about that roots. The roots of that old African tree are the keys to its life. The roots of this Diocese will be the keys to its life and future. When I met with the Bishop and Standing Committee last summer, we met in the conference room of Diocesan House. When I sat down in my seat I happened to look across the room. There, on the wall, was the famous portrait of Bishop James Theodore Holly, first Bishop of this Diocese. When I saw that portrait it brought to mind a deep childhood memory. My father was an Episcopal priest. And like many priests of African descent in the Episcopal Church in those days, he had copies of the books of Father George Freeman Bragg, Jr. In the late 19th and early 20th centuries Dr. Bragg, the Rector of St. James’ Baltimore, chronicled the history of sons and daughters of Africa in the Episcopal Church. When I was a child I use to play in my father’s study. And I remember thumbing through his books. One of the pictures and biographies was that picture of Bishop James Theodore Holly. I’ve been seeing that picture of him since I was a very little child. And he has long been a hero to me. Still longer, Bishop Holly is a hero and saint here, now one of the saints and worthies on the official calendar of our Episcopal Church. One whose witness to the strength of Jesus, and whose hope in a new future for the people of this beautiful island still nurtures the growth of this diocese and also the Episcopal Church itself. Soon after Bishop Holly left the United States and moved here, 43 members of the group who immigrated with the Bishop died from yellow fever and malaria, including his wife and some of his children. But he and others stayed. Bishop Holly loved Haiti, and the government eventually made him a Haitian citizen. And he is buried here in Haiti. He reminded his audience that under the leadership of Toussaint L’ Overture the people of Haiti, brought here as slaves had done something incredible. In the American Revolution most of the American colonists had at least some semblance of freedom before the American Revolution. They were colonists, not slaves. But the Haitian Revolution was a revolution of people who were slaves. And like the Hebrews under Moses in the Bible, they sought and won their freedom. The revolution in Haiti “is one of the noblest, grandest, and most justifiable outbursts against tyrannical oppression that is recorded on the pages of the world’s history. “In the name of God and humanity.” There in that voice, there in those words, there in the spirit of James Theodore Holly who lived for this Church and this land, there are the roots of this diocese. The roots of this diocese are in Bishop Holly’s fervent desire that the loving, liberating and life-giving Gospel of Jesus Christ should be proclaimed among the descendants of Africa here in Haiti. The roots of this Diocese are in Bishop Holly’s passionate conviction that following the way of Jesus the Church here might help the people and nation of Haiti to rise up and to claim the high calling among the nations of the earth. The roots of this Diocese are in Jesus Christ who died, and was raised from the dead, by the loving power of our God, who the Bible says, makes all things new. So, standing firm, rooted in the faith of Christ Jesus, let the Diocese of Haiti rise up and reach out anew! Rise up, reach out and go, make disciples of all nations. Rise up, reach out and go, proclaiming the Good New of Jesus to all creation. So keep on preaching the Gospel. Keep on teaching the children. Keep on healing the sick. Keep on feeding the hungry. Keep on loving the orphans. Keep on standing with the poor. And always remember, you do not do this alone. Your fellow Episcopalians stand with you. For we are not simply the Episcopal Church. Together we are the Episcopal branch of the Jesus movement. And Jesus promised, “I will be with you always, even to the close of the age. God love you. God bless you. And you keep the faith. Amen! I find it particularly poignant, as someone who has been to Haiti and been involved in a partnership there, that our Presiding Bishop is uniquely qualified by birth and background to speak of “our” rather than “your” ancestry. THIS is why diversity matters–because we white clergy do not need to lecture our black brothers and sisters on their own history. Thank you for this, Tom! And nice to see you here! Having known the Presiding Bishop since he was a young priest arriving in Cincinnati with his wife and little daughter Rachel, I rejoice to see and hear his clarion words reaching a wider and wider congregation. It will take time for all of us rather conventional Christians to step out into the life of the Jesus Movement, but by the grace of God and +Michael’s leadership, we will. Thanks be to God for you Presiding Bishop Michael! You brought light and hope to Haitian, faith be alive and grow, to work that faith to Christianity and prosperity. To equip ourselves of living words for the journey to lighten our path and to open the way for the continues and claiming God’s gift and blessings. Keep it up the Jesus works and movement Pres. Bishop Michael. We appreciate your works, God loves us all! Bishop James Holly for it is educative for the new generation of Episcopalians. I long for this reconciliation to reach Cange in the Central Plateau of Haiti. I am returning 31 May to my home there and pray our work may be useful and that we all will do God’s will.